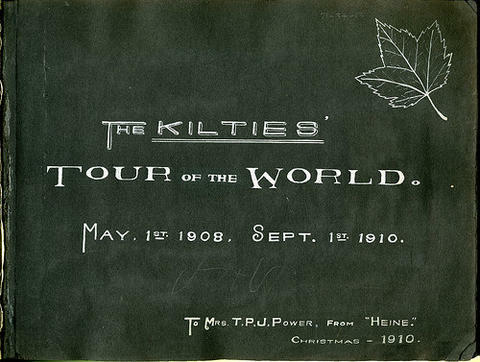 The Kilties Band of Belleville, Ontario, was one of Canada's most popular international touring bands of its day. Thomas P.J. Power and William F. Robinson were its first bandmasters, and its membership at times included cornetist, Mr. Voss, and pipe sergeant, David Ferguson (who also recorded bagpipe solos for Berliner). Playing at parks and touring on the vaudeville circuit, they eventually performed in 20 countries, appearing at the St. Louis World's Fair in 1904 and giving two Royal Command Performances in Britain. From 1908 to 1910 they went around the world, and in 1915 played to great critical acclaim at the Panama-San Diego Exposition. Donated by John D. Ryan in 2010. Album contains 317 photographs documenting the journey of the Kilties band around the world. The group visited Hawaii, Fiji, Australia, New Zealand, Sri Lanka, India, Myanmar, Egypt, Italy, Sicily, France, Gibraltar, Scotland and England to perform concerts. The photograph document the tourist activities the party took part in on their trip.